American Islamic College will be holding its first graduation ceremony on May 3rd, Friday at 6:00 pm. This is a significant moment for all of AIC family. AIC is excited to hold a graduation ceremony for our graduating students to acknowledge and cherish their remarkable achievements. Tickets are not limited, and the ceremony is open to the public, but please RSVP using the form below by Tuesday, April 30th. This course is designed to help you cultivate a wholehearted, nourishing, and sacred relationship with yourself through the One who created you! It is about transforming the way we understand and view love and how we can express that love for God and ourselves in a way that can empower our spiritual, mental, & emotional growth and wellness! These are common questions that might come to your mind when you think of “self-love.” That is because self-love is a term many of us have not truly understood because it is rarely talked about in our communities and the way that it is sometimes taught in our society is not inline with Islamic teachings! But understanding self-love and how to have a fulfilling relationship with ourselves are crucial for our spiritual growth and our over all well-being! That is because the relationship we have with ourselves impacts every other relationship in life! Join this Self-Love Course to get your answers and learn how to view this sacred relationship with yourself in a way that fuels your religious, spiritual, mental, and emotional growth! Dr. Marwa is the CEO & founder of H.O.M.E. She is a psychologist, educator, & writer dedicated to providing spiritual, mental, & emotional transformation & empowerment through psycho-spiritual education & services that are rooted in Islamic teachings! For many years, even before she pursued her education in psychology, Dr. Marwa was always passionate about navigating and exploring psychological and self-help topics within an Islamic & spiritual context. In addition to her Islamic studies as well as her extensive explorations and studies within the self-help world, she has also studied psychology extensively for 10 years. In addition to completing both her bachelors and masters degree in psychology, she has also completed her doctorate of psychology (PsyD) degree at The Chicago School of Professional Psychology. Her doctoral research focus was on Islam & Psychology as she completed a research study titled, “An Islamic Psychological Approach to Psychotherapy.” Her main aim in this study was to shed light on the powerful knowledge and tools that Islam has to offer to the world of psychology. Dr. Marwa views herself as a constant student of Islam and strives to always seek the knowledge that will empower her own spiritual growth but also help her provide others with the education and services that are well rooted in sound Islamic knowledge. Through her studies of Islam, psychology, research, and through continuously consulting with Islamic teachers and scholars, Dr. Marwa hopes to offer others the knowledge and tools they need to empower their spiritual, mental, and emotional growth as well as cultivate healthy and fulfilling relationships with God, themselves, and others! Parking: Free, located in the rear of the main building at 613 W. Bittersweet Pl. When she was a young lawyer, Kholoud Al-Faqih walked into the office of Palestine’s Chief Justice and announced she wanted to join the bench. He laughed at her. But just a few years later, Kholoud became the first woman judge to be appointed to the Middle East’s Shari’a (Islamic law) courts. THE JUDGE offers a unique portrait of Judge Kholoud—her brave journey as a lawyer, her tireless fight for justice for women, and her drop-in visits with clients, friends, and family. With unparalleled access to the courts, THE JUDGE presents an unfolding vérité legal drama, with rare insight into both Islamic law and gendered justice. In the process, the film illuminates some of the universal conflicts in the domestic life of Palestine—custody of children, divorce, abuse—while offering an unvarnished look at life for women and Shari’a. Discussion with Assoc. Professor of Anthropology, Dr. Shabana Mir, will follow. Shabana Mir is the author of the award-winning book Muslim American Women on Campus: Undergraduate Social Life and Identity, published by the University of North Carolina Press (2014). The book has received the Outstanding Book Award from the National Association for Ethnic Studies and the Critics’ Choice Award from the American Educational Studies Association (2014). Dr. Mir has over thirteen years’ diverse teaching experience. She taught Anthropology at Millikin University, IL (2012-2014) and graduate and undergraduate courses in Qualitative Research Methods, Education, Anthropology, and Literature at the University of Southern California online (2014-2015), Oklahoma State University (2008-2012), Indiana University (1999-2001), and Eastern Illinois University. She taught English at the International Islamic University, Islamabad (1991-1993). Dr. Mir earned her Ph.D. in education policy studies and anthropology, with a concentration in comparative education, from Indiana University, Bloomington. She received the Outstanding Dissertation Award for her doctoral dissertation from the American Anthropological Association’s Council on Anthropology and Education (2006). She conducted ethnographic fieldwork in the Washington, DC area, as Visiting Researcher at the Center for Muslim-Christian Understanding, Georgetown University. She also has an M.A. in English Literature from Punjab University, Pakistan and an M.Phil. in Education from Cambridge University (UK). Dr. Mir has lived, studied, and taught in the United States, the United Kingdom, and Pakistan. She has worked as curriculum designer, residence hall director, retreat leader, feminist troublemaker, faculty development expert, and research consultant in a variety of settings. Shabana has written academic chapters, journal articles, children’s literature, a blog, and, of course, her book. She is an International public speaker on gender, religion, education, and politics. She speaks English, Urdu and Punjabi, and some Arabic and Farsi, and is delighted to be part of the American Islamic College community. On Saturday, October 20, 2018, AIC screened The Judge, a powerful film about a young Palestinian woman’s journey to becoming the first female judge in the Middle East’s Shariah courts. The film provoked a thoughtful discussion about a number of topics interspersed and interconnected in the film. The conversation was led by AIC’s Associate Professor of Anthropology, Dr. Shabana Mir, who teaches courses on Islam and Gender, and Muslims in Modernity, taking her students deep into critical issues and their relation to contemporary movements both in America and theMuslim world. WBEZ’s Curious City and American Islamic College are hosting an interactive workshop on building interracial relationships within the Chicago-area Muslim community. The topic is “Race, Power, and Representation” and our guiding question is: How can Muslim organizations represent and give equal voice to the diversity of the Muslim community? The workshop — featuring a panel discussion and a series of facilitated small group conversations — will address issues of race, power, and representation in masjids, community organizations, educational institutions, and the media. Participants will have the opportunity to develop specific recommendations for how to create more inclusive Muslim institutions. Tahera Ahmad is the associate chaplain and director of interfaith engagement at Northwestern University. She also serves as faculty at Garrett-Evangelical Theological Seminary on the Northwestern campus. Ahmad was recognized at the White House as a leading Muslim woman and in 2014, she became the first woman to represent the United States at the International Quran Competition in Indonesia, where she placed 6th place in the World. Tariq El-Amin is one of the leaders of the Community of Imam Warith Deen Mohammed in Chicago. He is also the host of Radio Islam, a Muslim-run-and -produced daily call-in talk show, the resident imam of Masjid Al-Taqwa, and the founder and executive director of Bridging the Gap, Inc.
Abdullah Mitchell is the Executive Director of the Council of Islamic Organizations of Greater Chicago, an organization that provides resources and guidance to local Masjids and Muslim community organizations. He is also a board member of Masjid Al-Taqwa, American Islamic College, and the Southland Ministerial Health Network. Shabana Mir is Associate Professor of Anthropology and General Education Coordinator at American Islamic College. She is the author of the award-winning book Muslim American Women on Campus: Undergraduate Social Life and Identity. WBEZ Curious City Editor Alexandra Salomon will moderate the panel discussion, which will be followed by facilitated small group conversations and a share-out. Halaal drinks and snacks will be served. This workshop is co-hosted by American Islamic College and WBEZ’s Curious City. It was inspired by a Curious City feature about whether Chicago’s Arab and African-American Muslims share the same mosques. Feel free to contact programs@aicusa.edu or (773) 281-4700 ext. 202 if you have any questions. We look forward to your participation. WBEZ’s Curious City and American Islamic College hosted an interactive workshop on building interracial relationships within the Chicago-area Muslim community. WBEZ Curious City Editor Alexandra Salomon moderated the panel discussion. Founder of Side Entrance, Hind Makki, coordinated the facilitation of small group conversations that addressed issues of race, power, and representation in masjids, community organizations, educational institutions, and the media. Participants had the opportunity to develop specific recommendations for how to create more inclusive Muslim institutions. Featured panelists included AIC’s Associate Professor of Anthropology & Islamic Studies, Dr. Shabana Mir, AIC Board Member, Gregory Abdullah-Mitchell, Exec. Dir. of CIOGC, Tahera Ahmad, Assoc. Chaplain at NU, Tariq El-Amin, Imam at Masjid Al-Taqwa & Radio host at Radio Islam. In addition to the panelists, Bashirah Mack of Sapelo Squared, Eman H. Aly, Founder of Collaborist, and AIC’s undergraduate students: Ahmet Sahin, and Linda Maryam Millan served as facilitators of the group discussions. At the end of the collaboration, participants shared their commitments to solutions-based outcomes that build equity and trust for their fellow Muslims in the larger Chicago community. This workshop was inspired by a Curious City feature about whether Chicago’s Arab and African-American Muslims share the same mosques. On Friday, August 31st, AIC welcomed graduate students from The Lutheran School of Theology (LSTC) for a dialogue luncheon. 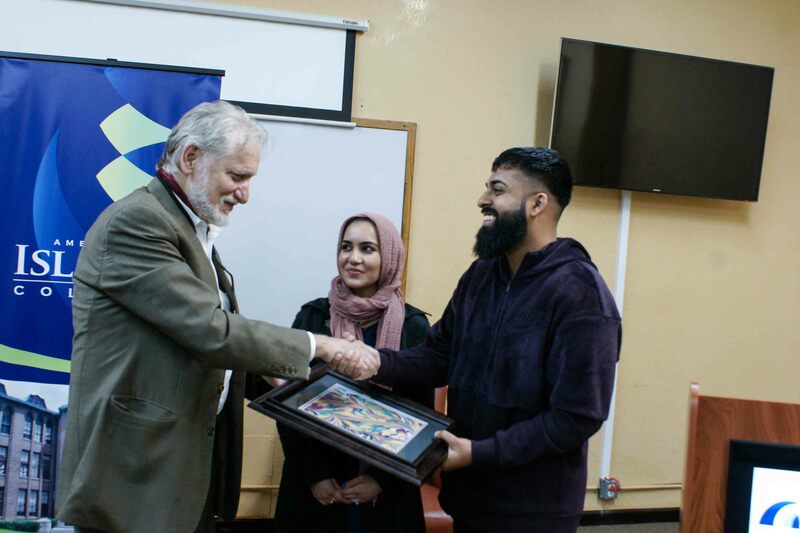 The students were welcomed by AIC President, Daoud S. Casewit and Dr. Feryal Salem, AIC’s Director of the Master of Divinity in Islamic Studies and Muslim Chaplaincy program. The students toured the campus and learned more about AIC’s fascinating history, as well as, its current role as an Islamic-oriented institution of higher learning. During their visit, the students had the opportunity to observe Jumah prayer, which is the Muslim congregational prayer service held on Fridays, at the AIC Masjid on campus. The dialogue that followed was centered around Muslim and Christian prayer, as well as, chaplaincy and spiritual care. This was organized by Sara Trumm, Interim Director of the School’s Center for Christian-Muslim Engagement for Peace & Justice (CCME) as part of their new student orientation. Those that participated are training to be pastors through LSTC’s Master of Divinity degree program. AIC Participants included: AIC President, Daoud Casewit, Dr. Feryal Salem, Director of the Master of Divinity Program, Romana Manzoor, Interfaith Coordinator, and Mesut Mamaloglu, BA student. This course gave an overview of the structure, themes, and guidance contained in each of the 114 chapters of the Noble Qur’an. This was achieved through the systematic study of each of the chapters. In particular, we looked at how Surah names are related to each Surah and the historical contexts of their revelation (Asbab al-Nuzul);The inter-textual relationship and coherence (Nazm) between verses of each Surah and the relationship with preceding / following Surahs;cross-referencing to other parts of the Qur’an in order to demonstrate how the “Qur’an explains the Qur’an”;explanation of key passages in each chapter; practical guidance and lessons that can be derived from each Surah. We also discussed the linguistic and stylistic devices (Balaghah) used in the Qur’an, and some of the problems with translation and having alternative plausible interpretations. Hafiz Abdullah Muhammad studied in an Islamic School and also memorized the Quran by heart at the age of 19. He has an MA in Islamic Studies (Distinction) from SOAS and also recently completed an intensive post-graduate course at the Al-Azhar University in Egypt. He is a qualified teacher of Religious Education and a Lawyer specializing in Employment law. He has done extensive researches on the Quran, published over a dozen articles and is the author of “The Best of Times in Islam” (IPCI, 2002). He spends most of his spare time delivering various Quran courses for the Quran Study Group and various course providers. He has been teaching this course for now 10 years in London and now first time in the USA. RIOTcon, the biennial conference hosted by the InterReligious Institute (IRI) at Chicago Theological Seminary (CTS), is offering an innovative, immersive experience to counter anti-Muslim bias & Christian privilege. We invite students, organizers, activists, faith leaders, educators, and professionals to this creative conference. Persons of faith and persons of no particular faith are welcome. Join us for two dynamic days of deep engagement through facilitated cohorts, interactive workshops, artistic performances, and plenary discussions, as participants and presenters generate new understandings and commit to actions to recognize and reduce anti-Muslim bias & Christian privilege in our communities. After the conference, the IRI will follow participants, offering support and tracking the effects of our time together. Come ready to learn, engage, and do the work of creating the Beloved Community. Thursday evening, we partner with our friends at the American Islamic College. We travel to the north side of the city where they bring to their stage Ifrah Mansour. A multimedia performance artist, her work is centered on the idea of displacement and Somali culture. Mansour, who lives in south Minneapolis, was named one of 10 Somali artists and entertainers to watch in 2015 by OkayAfrica, a global media hub that covers African culture. A talk-back session with the audience and other artists will follow her performance. Not your typical fundraiser, not your typical college! Join us on Saturday April 7th, 2018 for a unique experience and an opportunity to become a part of AIC’s story. Take a special journey and travel through different classrooms to get “schooled” by talented Muslim artists. Dinner will be provided by Kabul House. Amirah Sackett is an internationally recognized hip-hop dancer, choreographer, and teacher. Amirah was honored as one of the first female hip-hop artists to receive the Jerome Travel/ Study grant in 2008 and traveled to Holland to study and train at a center in Europe for hip-hop artists. She continues to tour, teach, perform around the country and in her hometown of Chicago. Amirah believes hip-hop culture, as a whole, gives voice to those often unheard and is a way to uplift, inspire, and bring change to those communities that need it the most. An activist by temperament, the daughter of a Choctaw woman, Jacinda Bullie aka Jah da Amp Mouth is a humunist, wife, moms, and practicing Muslima. Prior to rhymes, Jacinda was a natural critique of circumstances, interrogating the world through Hip Hop Poetics. In ’96, Jacinda aka JahdaAmpMouth, alongside Jaquanda V. and Leida GM., co-founded Kuumba Lynx, a Hip Hop art & culture collective. Jacinda is currently a co-curator of the Chicago Hip Hop Theater Fest. Jah recently co-authored a poetic coloring book entitled FILLINZ…Put Some Respect on It! Su’ad Abdul Khabeer is a scholar-artist-activist who uses anthropology and performance to explore the intersections of race and popular culture. Su’ad is currently an associate professor of American Culture and Arab and Muslim American Studies at the University of Michigan. She received her PhD in cultural anthropology from Princeton University and is a graduate from the School of Foreign Service at Georgetown University and completed the Islamic Studies diploma program of the Institute at Abu Nour University (Damascus). Her latest work, Muslim Cool: Race, Religion and Hip Hop in the United States (NYU Press 2016), is an ethnography on Islam and hip hop that examines how intersecting ideas of Muslimness and Blackness challenge and reproduce the meanings of race in the US. She has also written for The Root, the Washington Post, the Atlantic, Ebony Magazine, the Huffington Post, Religious Dispatches and Trans/Missions, and has appeared on Al Jazeera English. Sevim Surucu is an Ebru (Turkish Paper Marbling) artist living in Chicago, IL. She graduated from Istanbul University with a Bachelor of Art degree in Landscape Architecture. After working as a landscape architect for a while in Turkey, she moved to the United States. In 2004, she started studying the art of paper marbling because she wanted to combine her love of nature with her love of Turkish Traditional Arts and sharing her prosperous culture to others. In her marblings, she utilizes traditional flower forms and contemporary designs as well as designs of her own. She held many art fairs, where she got awarded many times as an “Outstanding Artist” at the art fairs. Hind Makki is an interfaith educator who develops and delivers workshops on active citizenship and community empowerment. An internationally recognized speaker, she has spoken on the subjects of interfaith cooperation, civic integration, and developing Muslim women’s leadership throughout the United States and Western Europe. Hind is also the founder and curator of Side Entrance, a website that documents women’s prayer spaces and experiences in mosques, and she serves on the Islamic Society of North America’s Mosque Inclusion Taskforce. Her work is focused on challenging misogyny, racism and sectarianism in Muslim communities across the country, and has been featured in a wide variety of media including ABC News, Al Jazeera English, National Public Radio, and The New York Times. Hind is an alumna of the American Muslim Civic Leadership Institute and holds a degree in international relations from Brown University. Ustadh Ubaydullah Evans is ALIM’s first Scholar-in-Residence. He converted to Islam while in high school. Upon conversion, Ustadh Ubaydullah began studying some of the foundational books of Islam under the private tutelage of local scholars while simultaneously pursuing a degree in journalism from Columbia. Since then he has studied at Chicagoland’s Institute of Islamic Education (IIE), in Tarim, Yemen, and Al-Azhar University in Cairo, Egypt, where he is the first African-American to graduate from its Shari’a program. Ustadh Ubaydullah also instructs with the Ta’leef Collective and the Inner-City Muslim Action Network (IMAN) at times.